The lovely, "chatty Italian" herself! Every year, the Audiobook Publisher's Association (APA) of America hosts The Audies, which recognizes audiobooks of distinction and the voices that bring the words to life. 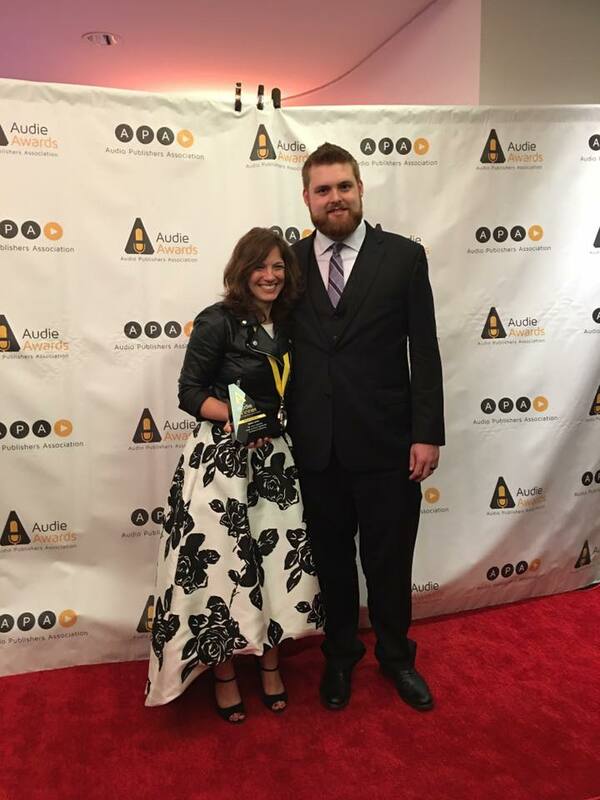 I recently caught up with actress and audiobook narrator Nicol Zanzarella, who in June won her first Audie for her work on the supernatural romance/thriller Ghost Gifts by Laura Spinella and produced by Brilliance Audio. This self-professed "chatty Italian girl from New York" currently residing in Los Angeles shared her thoughts on her craft, what it means to be a storyteller, and how audiobooks just may save the world. Listen to more of my interview with Nicol at the bottom of this blog post! Ghost Gifts seemed like such a perfect fit for you. It's New York, it's Italian...did you choose to work on this project? I have to give it up to fate and David Andrews at Brilliance Audio who put this book in my lap. I have found that there are a couple of really special people in this business that seem to take great care in matching projects and voices...and I give all appreciation to David on that. The author Laura and I like to say that the ghosts are kinda watching over us because this has been an extraordinary experience from the get-go. I recorded that book at night and I am a scaredy-cat! I would leave the studio looking over my shoulder with my flashlight on. What first inspired you to become an audiobook narrator? What are you listening to these days? Do you have any fellow narrators that inspire you? I gotta admit - I still have a love for the actual book in my hands - and, I'm a dogear. I like to wear in my books and take notes, so in truth I have a lot more listening I have to do. Someone who inspires me is Tavia Gilbert. One of my favorite audiobooks is one I just recently listened to called I'll Be Seeing You (narrated by Gilbert and Kate Rudd). I highly recommend it. At one point I stood by my kitchen counter bawling listening to that book. When a narrator does what they do so well, it's not some grand, costume performance - it's so quietly simple and exquisite and that's what they (Gilbert and Rudd) did with this book, and what I strive for. I love Tavia's work and what she brings to it - it leaves me speechless. (Critic's note: Ms. Gilbert won an Audie for Best Female Narrator of the year, also in June). You identify yourself as a storyteller. Why do you think stories are so important? First and foremost my family has instilled in me a love of tradition - everything from the Italian side of my family with Sunday dinners and traditional holidays to my mother who studies Native American tradition and storytelling. It's our history, it's our roots; it's the way we ever first started to share information. You can tell stories so many ways - but I chose this way because it encompassed the things that have become important to me in my life. And maybe also because I like to talk a lot, which Martin, my better half, will attest to (laughs). There's the tradition and there's the roots aspect of humanity in storytelling, and I also think it is where we can go to find out that we are not alone...in that we can read or listen to the story of someone we could never in a million years identify with and find something that strikes home. I truly think that through sharing stories and really trying to listen to each other we could possibly save the world. Artists often face the question, "Is what we do important?" In the grand scheme of all the things going on in the world at any given time, particularly now, whatever you can do and whatever way you might touch something in someone even if it is in the back row of a poorly attended performance, it is still something. It awakened something in you for having done it or one other person somewhere along the way that might have that lightning bolt go off in them. That is what we're all doing here, I hope.